Today’s Midweek Special focuses on the Theft of Credit Cards which took place in Delaware County Ohio. On Monday, March 11, 2019, a female victim reported her credit cards stolen from her purse while at the St. Joan of Arc Church in Powell, Ohio. 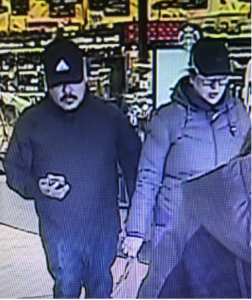 Shortly after the theft took place, two suspects were caught on camera exiting the Kroger store located at 3975 W. Powell Road in Powell, Ohio. The two suspects purchased $6,500 worth of gift cards just moments after the credit cards were stolen. A photo of the suspects may be viewed on our website, www.stopcrime.org.